Hey, jelly beans! First of all, I wanted to thank you for all your lovely birthday messages on Twitter. I had an absolutely wonderful weekend away with my better-half - we spent the day at the beach in Weymouth, which totally surpassed my expectations. Turns out, England has some beautiful beaches, too! We got quite lucky with the weather, so we spent the entire day enjoying the warm sand and the clear blue sea. I only wish the weekend had lasted longer, but we're definitely making the trip again next year! Today on the blog, I'm really excited to talk you about something a little different. If you've been following me for a while, you probably know that I'm not hugely into fashion. Whilst I enjoy reading about it on other blogs, my personal fashion sense is quite simple. I keep my outfits pretty casual all year round, and it never takes me longer than three minutes to decide on what I'm going to wear for the day. One thing that I like to spend time on, however, is picking the right jewellery. I think that jewellery can really transform an outfit, dramatically and effortlessly change the style and the look you're going for. 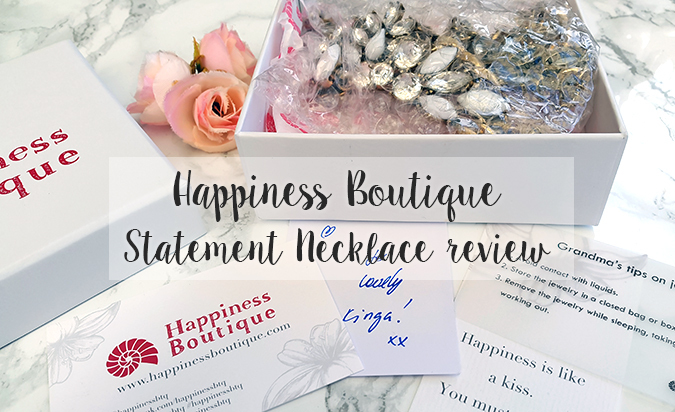 This is why, when Happiness Boutique contacted me to review one of their gorgeous jewellery pieces, I couldn't be more excited! 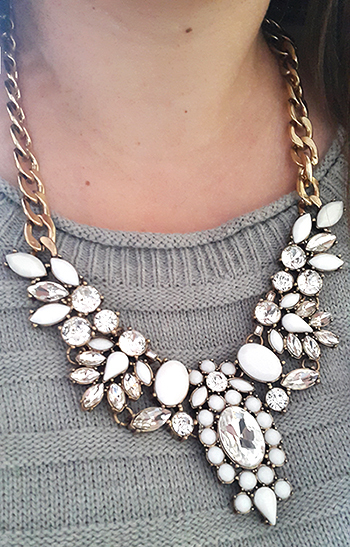 Today, I'll be talking about their lovely Snow White statement necklace from the necklaces collection. Hope you enjoy! The first thing I noticed about the Happiness Boutique website was the overwhelming and diverse selection of different jewellery types, styles, colours etc. 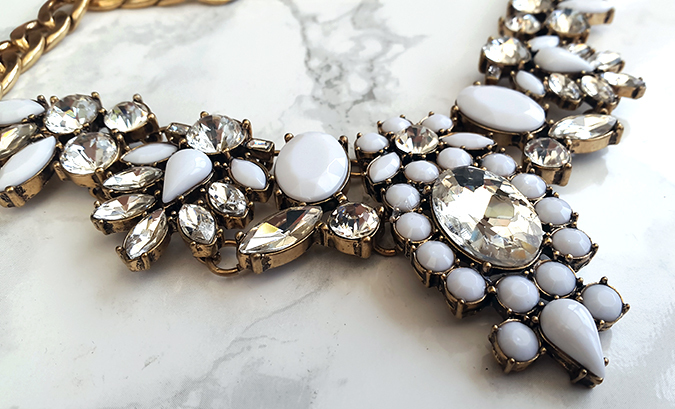 I was kindly given the opportunity to choose from one of over 200 statement necklaces for this review, and honestly, it was not an easy decision! They offer so many gorgeous, eye-catching pieces; I ended up opening about fifty tabs before I could finally decide on the one. I've noticed quite a few handy tools on the website that can help you narrow down the selection - you can filter out jewellery types by material, style, colour and price range. There are also photos attached to most items that show different girls wearing the jewellery (I'm guessing bloggers who collaborated with the brand), which gives you a good idea of what the products look like in person. My package arrived in less than a week, which was impressive considering that the order was shipped all the way from Germany. The necklace arrived in a cute, white box with a personalised note, a card with a quote on happiness and some tips on how to look after your jewellery. Overall, the presentation was lovely, but what's more important is that everything was packaged very securely. The necklace itself was tightly wrapped in bubble wrap, with a sheet of paper around it. It actually took a bit of effort to unwrap it! The Snow White statement necklace turned out to be even more beautiful in person than I expected. It is a gorgeous, sparkling piece of jewellery; with beautiful, clear rhinestones and a few golden accents. The quality is exceptional and I couldn't be more pleased with it! It's sturdy, but not too heavy and very comfortable to wear. Although I'm no fashion expert, I think that this necklace would work well with a simple dress or a neutral colour top. It's casual enough for everyday wear, but you could also pair it with something more special if you're going out. Either way, it is a great way of adding a little dazzle to your outfit! If you're interested in checking out Happiness Boutique, make sure you use the code shoesandglitter to get 10% off your purchase (available on all orders over 19 euros, code valid until 18th September). Happiness Boutique offers free worldwide shipping, and you can also enter their reward program for additional benefits, surprise gifts etc. Personally, I am very pleased with the necklace I received, and I can definitely see myself purchasing more of their statement pieces in the future. The quality is beyond exceptional, and there are more styles and colours available than I've seen on other websites. 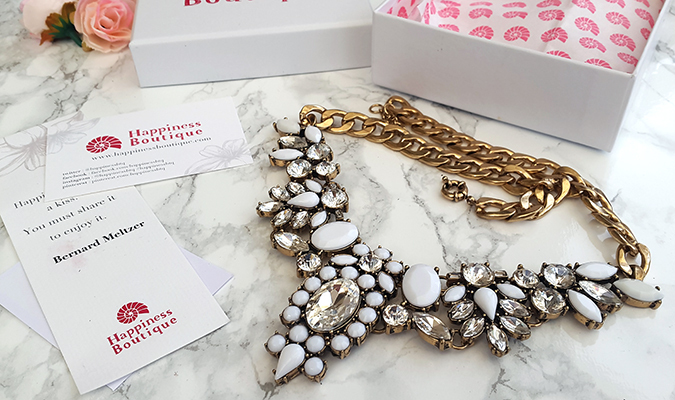 I would wholeheartedly recommend Happiness Boutique if you're looking for a perfect gift, or if you want to expand your jewellery collection with something really special.